Pakistan lies between 23 degrees 35 minutes to 37 degrees 05 minutes North latitude and 60 degrees 50 minutes to 77 degrees 50 minutes east longitude. It touches the Hindukush Mountains in the north and extends from the Pamirs to the Arabian Sea. The country has a total area of 796,095 sq km and is nearly four times the size of the United Kingdom. From Gwadar Bay in its south-eastern corner, the country extends more than 1,800 km to the Khunjerab Pass on China' border. 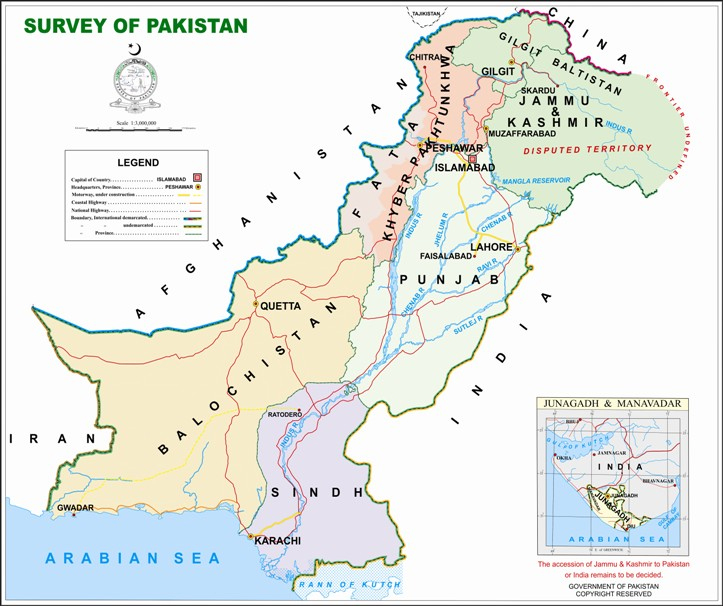 It consists of such physical regions as a) the western offshoots of Himalayas which cover its northern and north western parts of which the highest peak K-2 rises to 8611 meters above sea level; b) the Balochistan plateau c) The Potohar Plateau and salt range and d) The Indus plain, the most fertile and densely populated area of the country. It gets its sustenance from the Indus River and its tributaries. Climatically, Pakistan enjoys a considerable measure of variety. North and north western high mountainous ranges are extremely cold in winter while the summer months of April to September are very pleasant. The plains of the Indus valley are extremely hot in summer with a cold and dry weather in winter. The coastal strip in the South has a moderate climate. There is a general deficiency of rainfall. In the plains annual average ranges from 16 centimeters in the northern parts of lower Indus plain to 120 centimeters in the Himalayan region. Rains are monsoonal in origin and fall late in summers. Due to the rainfall and high diurnal range of temperature, humidity is comparatively low. Only the coastal strip has high humidity. Urdu is the national language and is used as a medium of understanding throughout the country. Aside from this, Pakistan is culturally divided into four linguistic provinces. Punjabi is spoken in the Punjab, Sindhi in Sindh, Pashto in NWFP, and Balochi in Balochistan.